Are you or do you know someone who is currently anywhere between the north of Australia and the Bohai Sea in China? Have you seen any Red Knot? 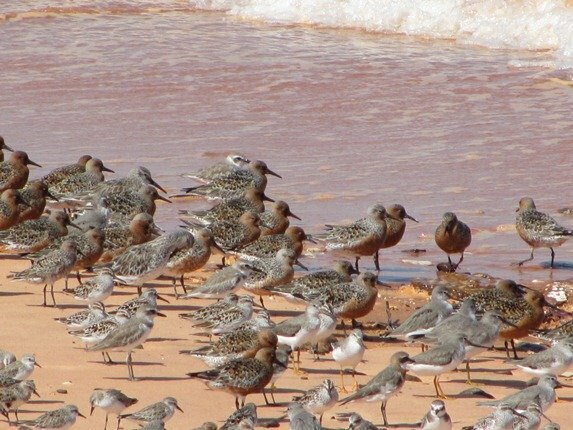 Even if you are somewhere on the coast in China…have you seen any Red Knot? 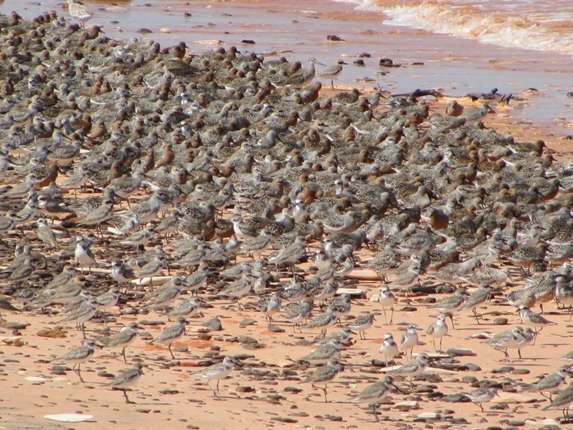 We know they are some of the last shorebirds to leave Roebuck Bay in Broome and some have not left yet, but where exactly do they go after they leave here? Some appear to go directly to China, but are they stopping somewhere like Sarawak? If you know of or have heard anything it would be great to know. With my voluntary work I am getting reports of shorebirds flagged and banded in Broome now visiting China, Hong Kong and Korea and any information is useful information. Reclamation of much used mudflats in Asia is causing concern as to where they may feed in the future on their migration routes. The shorebirds will continue north to their breeding grounds once they have acquired the necessary energy to make the final leg of their trip. 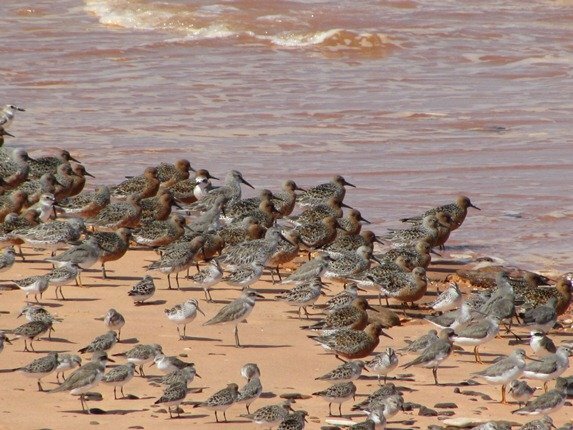 The Red Knot are surrounded by other smaller species in Roebuck Bay now, as the Bar-tailed Godwits, Black-tailed Godwits and Great Knots have mainly migrated to breed. This makes it a lot easier to see them and not only that-they are no longer grey! They are red and fat! This is the easiest time of year to identify a Red Knot with confidence and they are by far the fattest shorebird prior to migration. In the next few days we expect the last of them to head north, but some have already set off. There are people in China awaiting their arrival to try and learn more, but we are constantly learning about their amazing migration. Red Knot that visit Broome have also been shown to visit New Zealand, so they are really travelling the world. Red Knot tend to stand out prior to migration! They stand out even more when the flock is a bit thinner and it is rather nice when birds stand in species. 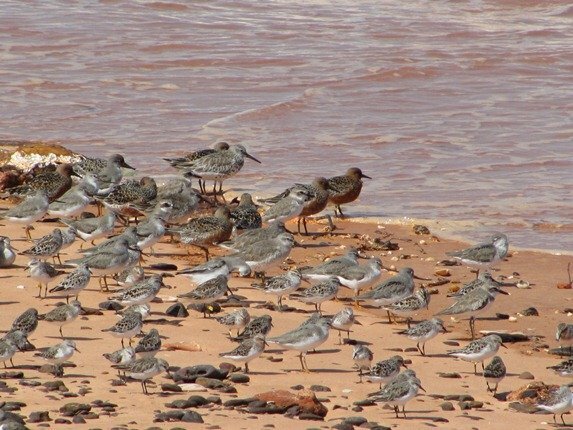 Here we have Red Knot close to the sea, Terek Sandpipers to the right-note the bright orange/yellow legs and upturned bills, Red-necked Stint like to stand at the back of the flock and the Greater Sand Plovers mingle along with the Broad-billed Sandpipers. At this time of year it is also a lot easier to see the Broad-billed Sandpipers as they have a distinct stripy head and thick bill. There are several in the photo below in the lower section. 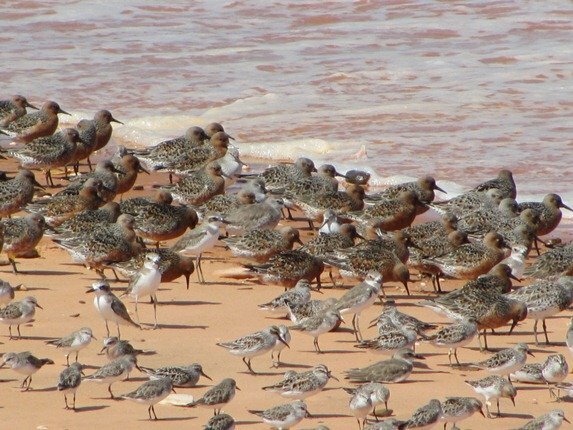 Every flock you find will have outstanding colours on the Red Knot and the Terek Sandpipers also show nicely with their bright legs. They are positioned on the right and there are some nicely striped heads of Broad-billed Sandpipers to the left. You will also note that the Red Knot do not all appear quite the same. 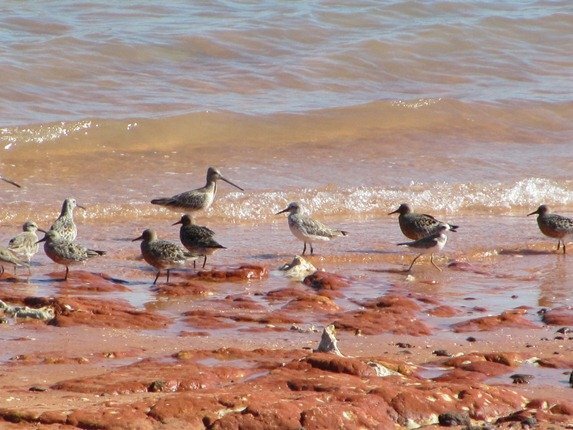 In Broome we get both the Calidris canutus Rogersi and Calidris Canutus Piersmai and the darker red birds are the Piersmai. I will include the next photo so that you get to see the difference between a Great Knot and a Red Knot, which is obviously easier once the Red Knot are red, but shows the difference in the size of the bird and it’s bill length. Every now and again you get lucky and you spot some Asian Dowitchers in the flocks and they are extremely good at hiding. Once you see one you soon discover there are more! Here I saw the flock thinning out and attempted a photo of one, but discovered I had the bill of a second! They stand out in the flock when you see their thick dark bill, as the Bar-tailed Godwits and Black-tailed Godwits all have pink tinges to their bills. One other thing I should mention is the individual marking you may see on shorebirds that have heading out of Roebuck Bay recently. They are carrying an individual flag as well as a metal band and we can easily read that in the field. Most overseas reports we get are of these “flagged” birds and some have been travelling back and forth for years now. 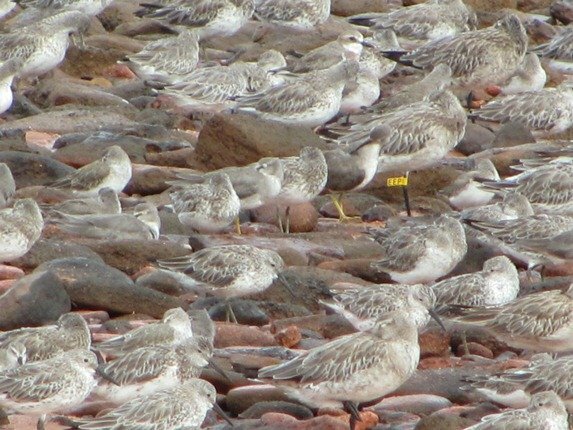 There is a Red Knot that’s over 22 years old and there may be many more. Here’s a Bar-tailed Godwit marked EEP. So, if you have seen any shorebirds heading north of Australia then we’d love to hear about them! Great post and cool photos. I saw my first RedKnots yesterday at Mispillion in Delaware. They usually show up after the horseshoe crabs lay they their eggs after the first spring full moon. Cool sightings. I just saw one of the biggest Red Knot flocks of my life yesterday, but it was in California. Cool photos! A lot of shorebirds I would love to see. Great post and excellent photos! I hope you receive many replies from people watching birds in China.